Mix together cream, milk, sugar, eggs, vanilla and salt and cook until 86°C. 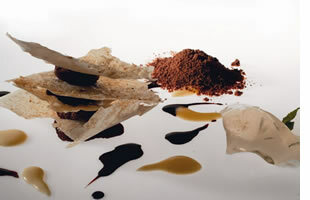 Add the pieces of chocolate while vigorously mixing, then emulsify the mixture in order to make it shining and flexible. Keep in the fridge for several hours. Phillo paste, crumbled mint sweets, syrup. Spread the phillo paste and wet with the sugar syrup, sprinkle with the mint sweets and cook in the oven. Mix and bring to boil water, cocoa, sugar and liquid cream; then pass them through the thin strainer. Bring the leaves to boil into the water, drain and cool with some ice so as to preserve the colour and then emulsify with a bit of syrup. Add the gelatine and keep in the fridge. Create the plate by inserting the chocolate cream with the crunchy leaves. Put the syrup, the mint gelatine, the fruit seasoned with a mint julienne, a small ball of mint sorbet, sprinkled with a bit of fresh grated cocoa, and the cocoa syrup.